The aesthetic is pretty clean and simple. No crazy lines or curves. It’s tall (in around a Hussar, Skyline, or Kayfun 5) but not any more than others on the market. A little wider at 24mm with a good 4ml juice capacity that includes a very large top fill slot. It looks like nothing special really. But inside, there is some serious magic going on. It look like it borrows from the likes of the Hurricane, yet not really. It’s the mix of a postless deck with a unique airport shape (bottom airflow) wrapped in a barrel section that simply snaps into place. It’s oddly simple. One other thing to note is the slotted top design of the chimney section- this is definitely playing a role somehow. Even the chimney it on the long side yet the vape tastes like you are right on top of the coils. It’s seems to be the work of mad genius in our opinion. Nothing shouts wow until you take your first haul. Easily one of the most saturated, full flavoured RTAs we have ever experienced. There is nothing even close. We don’t get it, and we do. It’s pressure, a perfect balance of it, the vacuum is nailed. The chamber isn’t even that reduced by today’s standards of tiny dual airflow on a single coil attys. The flavour is so good, it has taken us away from our latest infatuation with mech squonkers. Every juice is extraordinary and full of nuance in the Churchill. It’s what you would expect from a juice maker making a tank, right? Airflow can be wider open to make any Cloudchucker happy or nicely dialled in for a nice and tight restricted lung hit. There are two AFC rings included, one slotted and the other 4 drilled holes. We prefer the 4 hole with 2 holes open, perfect draw for us. The airflow is swooshy and quite for the size, the volume and size of the tank does create some noise, but nothing to cause attention. The design thinking again is impressive, the almost cross shaped airport hit you coils beautifully and seems to only add to the magic. Building is so simple. Maybe the name should have been Simple RTA? Postless decks don’t usually cause issues, get your wire lead length right and tighten down. With the Churchill you then simply pull/bend in towards the airport and get ready for the simplest wick setting we have ever experienced. As for builds, this is one extremely versatile atty, you can go crazy thick and big or as simple as a 24 awg, 6 wrap, 2.5mm, dual, spaced, at 0.3 ohms (our fav). It’s does not matter, you will get a great vape with any of them, it really is more about the temp of the vape and device you want to run. Not normally the case, usually every atty has a narrow sweet spot, the Churchill is wide open. Wicking. Damn. Not often we give a paragraph to wicking. All you do is cut your wick leads to the inner deck diameter, fan them out to cover the width of the deck and pop on the chamber/barrel section. Works every time and provides perfect juice flow. Just make sure there is not cotton interfering with the o-ring, if it is your leads are a little long. Juice capacity is pretty normal for the size, 4ml lasts a decent amount of time. Super easy to fill thanks to a very large juice port under the top ring. The tank is Ultem for now but as you see pictured more options are sure to follow shortly. We haven’t had any leaking issues of any kind during use or when filling. What haven’t we already said? What else can we say? We think you get the gist, get your hands on one! There will be accessories, an MTL kit, a Nano kit (or shorter tank), and maybe a few more surprises coming soon. This is one of those attys that you could choose to survive on a deserted island with. You’ll just need to figure out which device to pair it with. 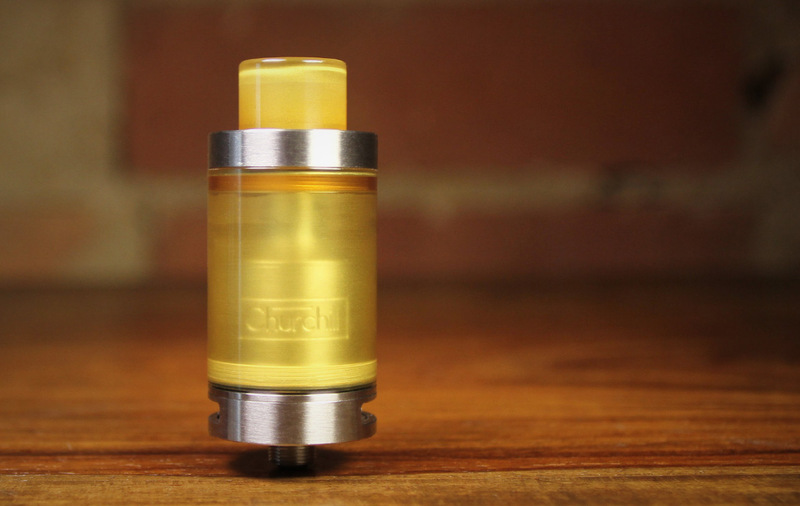 We are so proud that the first serious RTA to come out of Canada is the Churchill, we think it’s going to make a major splash. It’s funny that Quebec, where the vape legislation is the strictest in Canada has some of the best juice and modders (Deathwish and now E-Apothecary). Well done Alex, make a bunch more of these, and start another project!